"These are tender and the meat falls right off the bone. 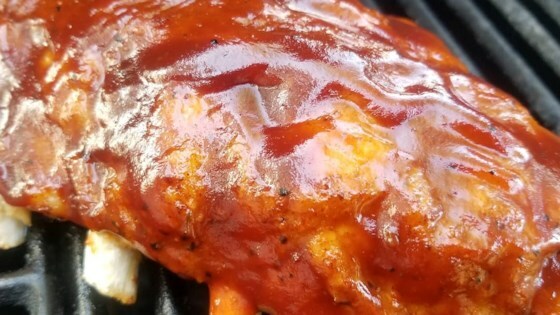 Generally, people think of baby back ribs as a meal they would only order when at a restaurant, but they are so easy to make at home. This recipe could not be any more simple." Tear off 4 pieces of aluminum foil big enough to enclose each portion of ribs. Spray each piece of foil with vegetable cooking spray. Brush the ribs liberally with barbeque sauce and place each portion in its own piece of foil. Wrap tightly and refrigerate for at least 8 hours, or overnight. Bake ribs wrapped tightly in the foil at 300 degrees F (150 degrees C) for 2 1/2 hours. Remove from foil and add more sauce, if desired.